It's done deal. Marikina Foods Corporation President and CEO Bobby Co and Ai-Ai delas Alas shake hand after the renewal of endorsement contract. MANILA, Philippines - Comedy Concert Queen Ai-Ai delas Alas remains one of the bankable stars in the entertainment industry. She just signed a renewal endorsement deal with Hobe Quick Noodles yesterday afternoon, July 25, at Ai Express Restaurant, Quezon City. “I hope this is another blessing from the Lord kasi ika fourth year ko na sa Hobe. Yes!” Ai-Ai’s opening statement during the press conference. Looking chic and fab, Ai-ai delas Alas arrives at Ai Sarap Express before the start of press conference. Ai-Ai is endorsing Marikina Foods Corporation's Hobe Quick Cook Bihon, the company’s top selling product. She believes that the company continues to ask for her service since the sales increased during the duration of her endorsement. “Mataas pa rin ang sales nila. Hanggat mataas ang sales siyempre kukunin ka nila. Yun lang naman pagkakaintindi ko. Pero baka favorite din ako ni Mr. Bobby Co. Hindi ba ganun ang mga Chinese. Kapag swerte ka, kinukuha ka nila parati,” delas Alas added. This was agreed by Bobby Co., President and CEO of Marikina Foods Corporation. “Gumaganda po ang sales ng Hobe. Nagpapasalamat ako kay Ms. Ai sa pagtanggap ulit sa amin at hopefully tumagal pa siya sa amin”, Co said to the press. Marikina Foods Corporation President and CEO Bobby Co and Ai-Ai delas Alas pose for photograph after the contract signing. Asked by the press if he will increase the Comedy Concert Queen’s talent fee. Co’s answered a resounding yes. If given a chance, delas Alas wants to cook pancit for President Rodrigo Duterte. She is also willing to cook for her colleagues in the showbiz industry. Hobe Pancit Palabok and Hobe Quick Cook Noodles are just some of the products of Marikina Foods Corporation . You can catch her at Sunday Pinasaya every Sunday and The Clash every Saturday and Sunday night. She is also busy promoting her indie film under Cinemalaya 2018, School Service, to be shown this coming August 5. She will also have another movie with Ex Batallion and another one under Regal Films. MANILA, Philippines - Asian Mixed Martial Arts (MMA) superstar Mark "Mugen" Striegl had a special appearance at the recently concluded Cosmo Body’s “Live Well, Feel Better HIIT Party” event at Anytime Fitness BGC yesterday afternoon, July 20. Mark is Filipino-American MMA fighter having fought in many different fight promotions around the world such as URCC, PXC, Legend, DARE Championship, and MIMMA. He led a 12 minute High Intensity Interval Training (HIIT) and ab circuit session in front of some fitness enthusiasts, bloggers and social media influencers. He also discussed the importance of sports nutrition in achieving a healthy and fit lifestyle. “You can workout as a professional athlete. You can workout every single day, very intensely, twice a day, two hours per session till complete exhaustion but if you’re not eating correctly and having right nutrition and taking the right supplementation, to be honest you will not going to get the most of your workout. Your body can get deteriorate and worst, you will not recover as fast. Your workout will go to waste. Treat your body like a temple: have a right diet and have a right supplementation.” Striegl told the press. The press also asked Mark’s message for those who want to start a healthy lifestyle. Aside from his various endorsements, he is also preparing for the URCC championship fight with a Korean fighter this coming August 25 at Manila Cove, Okada Manila. Also in attendance during the event are Nino Bautista and Red Gatus, founders of BFC Laboratories. “Anytime Fitness BGC High Street is our first stop on this tour. Through our ‘Live Well, Feel Better HIIT Party Tour’, we hope to spread the message of health and fitness through sports nutrition in a fun, interactive and informative manner,” said Nino Bautista during his speech. Resident BFC Nutritionist Zylen Flor Fanche also teach the participants during the event some nutrient dense, high- protein and easy to prepare food that is perfect for health and fitness conscious individual. MANILA, Philippines - To all Filipino anime fans out there, there is something you can be proud of. 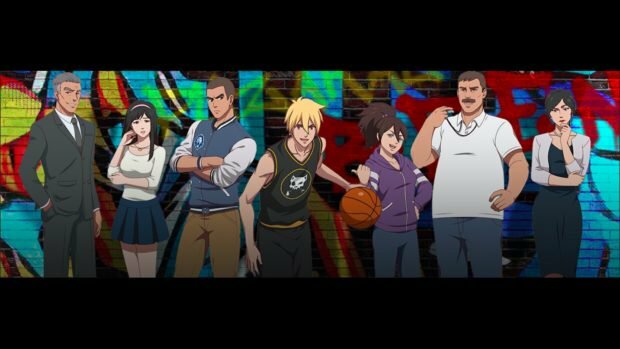 Filipino made anime series ‘Barangay 143’ will air on October 13, 2018 in GMA-7 after two years of making and intensive preparations. The show is made possible by Synergy88, a Philippine-based animation and game development studio and Singapore-based company August Media Holdings. Japanese television network TV Asahi also produced the show. According to their official website, Barangay 143 is a feel-good coming of age story of a young Korean boy whose search for his father brings him to the Philippines. Lost and desperate for answers, he finds an unlikely family in a team of misfits whose only ambition is to bring glory to their hometown. It's a story about love and family set against the action-packed world of street basketball. “GMA is the home of anime and we are also known for our drama. We are very excited since some of the stars who will be the voice of the anime is from GMA-7”, GMA Network’s Head of Acquisition Department Joey Abacan told the press. The series is made by Filipino talents but also utilized manpower from other countries such as Malaysia, Korea, USA, Singapore and Japan. The production started in 2016. The producers plan to air the show outside the Philippines as well. The voice behind the show. From left to right: Paolo Contis, Raver Eda, John Arcilla, Julie Anne San Jose, Migo Adecer, Kelley Day, Ruru Madrid, Cheri Gil, and Sylvia Sanchez. 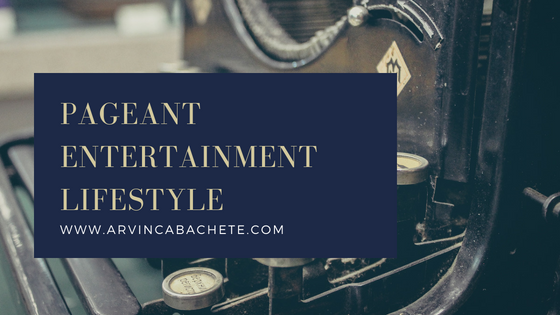 During the media launch held last July 17 at The Elements, Eton Centris, Quezon City, the producers revealed who will bring life the characters by lending their voice. The voice stars are Paolo Contis, Raver Eda, John Arcilla, Julie Anne San Jose, Migo Adecer, Kelley Day, Ruru Madrid, Cheri Gil, Sylvia Sanchez and among others. Gloria Diaz, Miss Universe 1969, is surrounded by well-wishers after she is crowned. 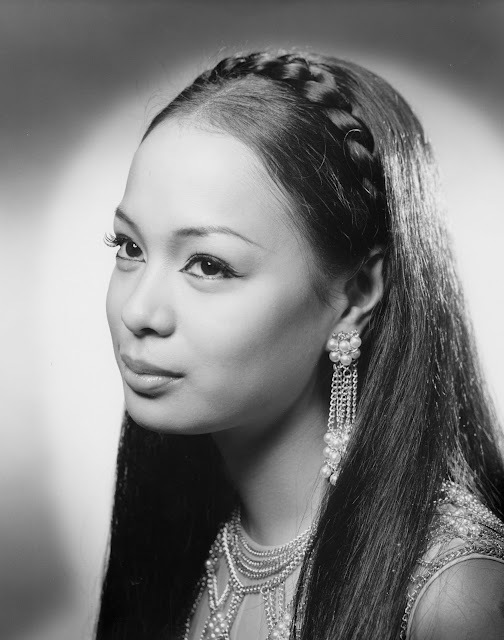 “Neil Armstrong of the United States just landed on the moon but Gloria Diaz @its.gloriadiaz of the Philippines has just conquered the Universe." - US Pres.Richard Nixon (July 19, 1969). 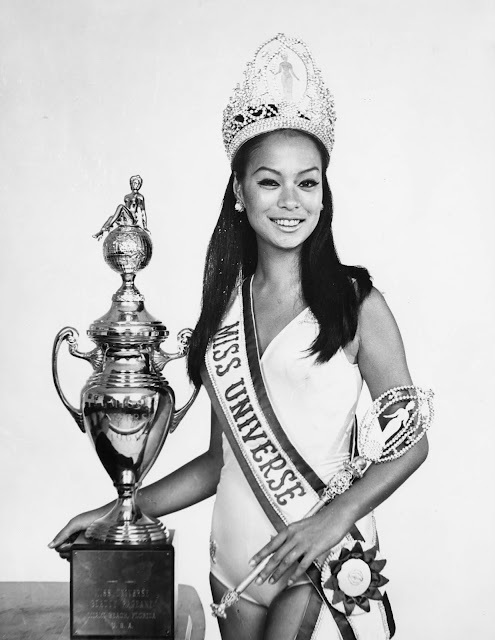 MANILA - Exactly 49 years ago today, Philippines got the first Miss Universe crown through Gloria Diaz. 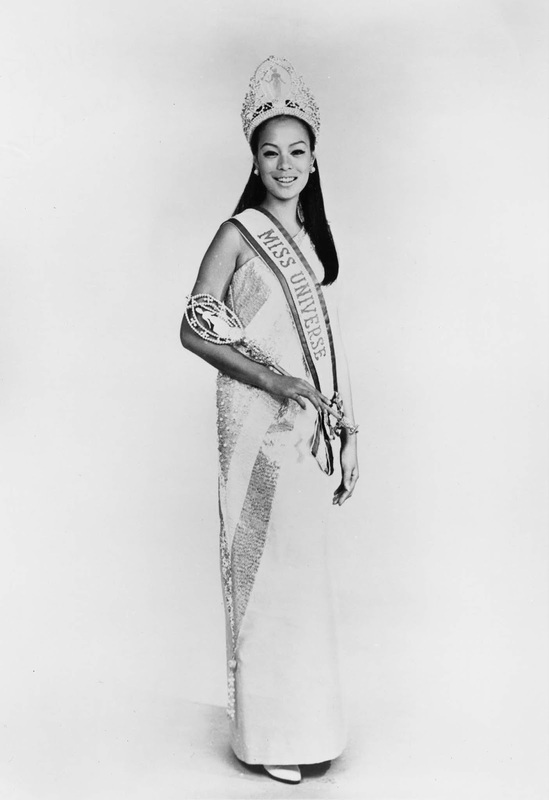 Let's go back to 1969 and have a glimpse of Gloria's official photos as Miss Universe. All photos courtesy of IMG Universe LLC. Man of the World 2018: Who is the Perfect Man to Conquer the (Your) World? 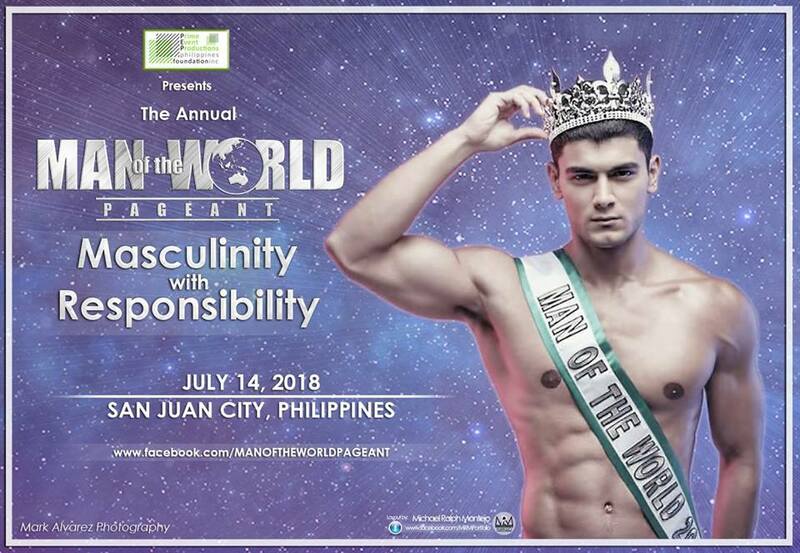 Two days before the finale, our contributing writer Dale Gregory Medina lists down the possible winner of the 2nd edition of Man of the World pageant. MANILA, Philippines – There is no denying that thirty of the most dashing and handsome gentlemen from all over the world are up to prove that they are the perfect man for the Man of the World 2018 title. Man of the World 2018 has been described as a competitive batch with contestants composed of movie stars, gym trainers, body builders, young professionals, doctors, a nurse and models. Now let’s take a look to the candidates who made sparks in the duration of the pageant. First is Peru’s Juan Carlos Cabrera Torres. Torres is the very first deaf candidate of the two-year old pageant. His main reason of joining the pageant is to inspire others most especially those handicapped people like him. Will this inspiring gentleman prove that there is no limit and boundaries to be Man of the World 2018? Let’s meet the pride of Guam, Joseph Lawrence Bondoc. Joe, his nickname, was born in Sta. 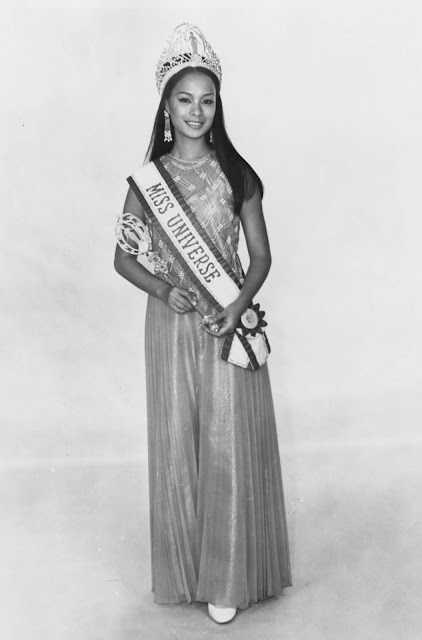 Rita, Pampanga and grew-up in Guam. He loves being immersed on both Guam and Philippine traditions and culture. He was mentored and coached by an international Filipino pageant coach, Shandy Montecarlo Lim. Being trained by a Filipino with competitiveness; will this island hottie bring home the very first Man of the World crown of Guam? Picking up the list is the heartthrob from Thailand, Natapol Srisarn. In an interview by Missosology, he said that it has been his dream to be Man of the World. He also mentioned that this will be his last attempt in pageant due to his age that’s why he is trying his very best to win the title. Will dreams and determination be his shining armor to win the title of Man of the World 2018? Next in line is the pride of Korea, Kim Gil Hwan. This professional diver hottie is the replacement of the original winner of Man of the World Korea but with his undeniable breathtaking appeal and charisma, he managed to impress every pageant enthusiast day by day. Will this professional diver make a perfect dive for the crown? Last but definitely never ever be the least is the Philippine pride, Clint Karklins Peralta. Clint is a registered nurse from the province of Camarines Sur. He is also a runway, print ad and TV commercial model. In an interview, Clint mentioned that this will be his last pageant stint. He said, win or lose, after his reign in Misters of Filipinas, he will fly back to London to practice his profession. Will his London comeback be postponed due to his Man of the World 2018 win? These gentlemen are more than ready to prove that they are the perfect man for the Man of the World 2018 title. Will one of them be declared as the winner? We’ll find out who will be the perfect man on the coronation night on July 14, 2018 at San Juan, Metro Manila. The reigning Man of the World is Mustafa Elizali of Egypt. Four days before the finale of Miss Universe Great Britain 2018, let us get to know more one of this year’s finalist, Jemma Johnstone. At the age of 16, she started a small interior design business and now she is studying a part-time diploma in interior design at the University of Westminster. “Homes and design have always been a passion of mine and I am aspiring to get on the property ladder and build on my business.”Jemma shared. “Now, aged 22, I have been given this amazing opportunity and platform to help me do just that. I have decided to work on a campaign/program to help young girls protect themselves from violence and difficult situations that they may face. Having trained in martial arts from a young age I want to use my skills and knowledge, to help young girls not only protect themselves but to build up their confidence as well.” Jemma added. She also shared in one of our chats that her favorite Miss Universe is Pia Wurtzbach from the Philippines. I also grab the opportunity to give some message to her Filipino fans. Please support Jemma on her journey to Miss Universe Great Britain 2018 along with her fellow candidates on July 14th. Winner will represent their beautiful country at Miss Universe pageant later this year. If there’s one beauty queen that caught the attention of fans in the pageantry world today, that would be Angela Ponce. 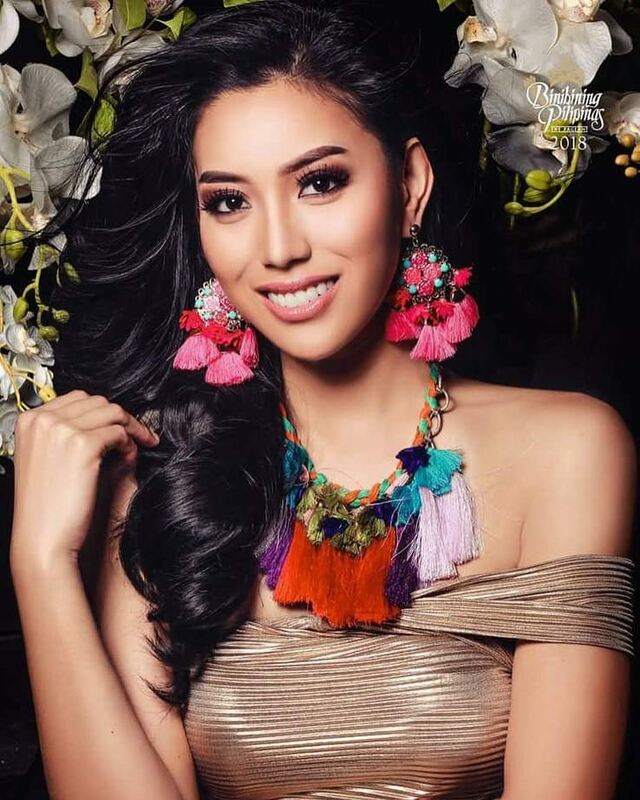 Angela makes history as she is the first transwoman who will compete at the Miss Universe pageant this year. Her win is not without controversy. Some pageant fans are not pleased with her victory, claiming that Miss Universe pageant is only exclusive for natural born women. Transgender women were previously banned competing in Miss Universe until 2013 when Canada’s Jenna Talackova challenged the ruling. “Bringing the name and colors of Spain before the universe is my great dream. My goal is to be a spokesperson for a message of inclusion, respect and diversity not only for the LGBTQ+ community, but also for the entire world. ", Ponce shared in her Instagram post. She first participated in Miss World Spain 2015 representing Cadiz. 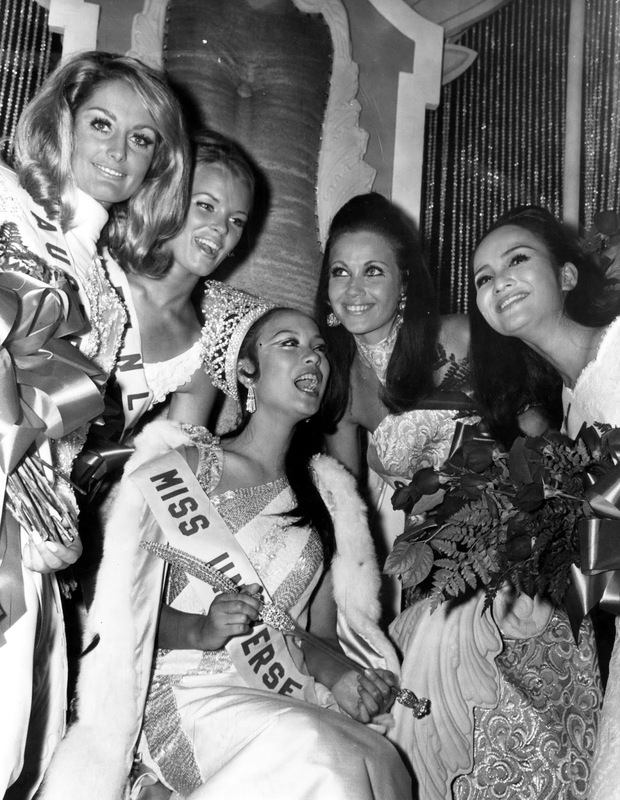 The pageant was won by Mireia Lalaguna Royo, who went on to win the Miss World title in China that year. "With the current issue of Miss Universe-Spain, it’s quite a challenge especially for us filipinos with conservative culture to welcome such idea. But as we go through time, culture also evolves and I don’t see anything wrong with it, especially if the rules of the pageant doesn’t apply or doesn’t specify such. I think that’s the first thing that we have to put into consideration, legalities. 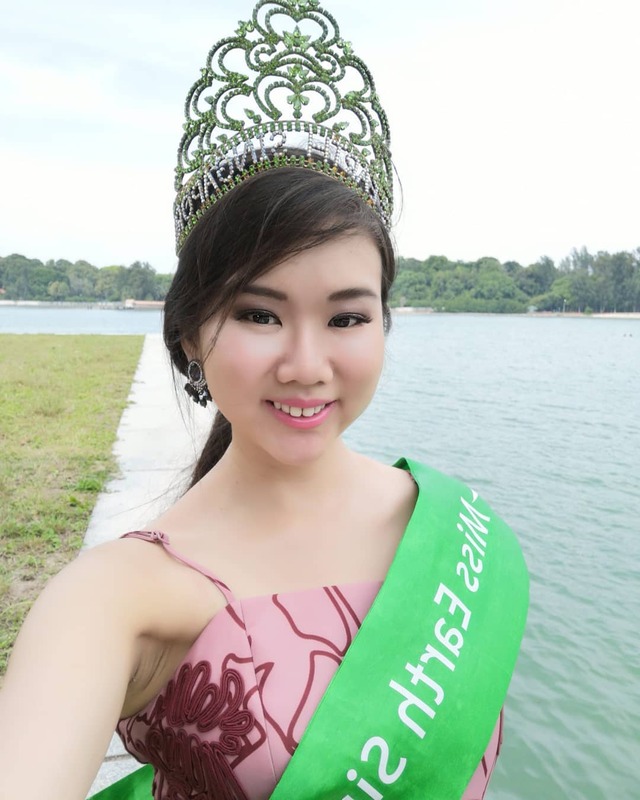 In the world of pageantry, we beauty queens have made it our platform to empower other women and urge them to stand up for their rights and fight for equality. To make known to the world that WE exist and have the same importance in society as men and that doesn’t exclude Transgender women, who by the way are also women. Their transition didn’t just happen in a snap of a finger. It’s a process they had to go through over time. Usually that process isn’t always easy. Many had to go through a lot of judgement, disrespect, and fear, the fear of not being accepted by society, worse, by their families. It’s a psychosocial and emotional struggle for them that we might not even know how to cope if we put ourselves in their shoes. It’s a battle they continue to face every single day. When in fact, acceptance is just all they wanted, to be recognized as members by such discriminating society, to be included and take part in it. Respect and acceptance is all we can give to them. An open mind and heart. If you cannot accept them, at least give them the respect they deserve as human beings. We may have our own different opinions but at the end of the day we’ll have to leave the final verdict to the Miss Universe organization. Whatever decision they come up with, we’ll just have to accept and support the organization on that matter." Just because she wasn’t born as a female, who are we to say she hasn’t gone through hard times in her life. That’s what this organization stands for. It’s supposed to inspire and empower women. What do you think? Should transwomen be allowed to join Miss Universe? Share your thoughts in comment section below. Follow the footsteps of Andrew Wolff, Sam Ajdani, and John Spainhour when you join Mr. World Philippines 2018. Ms. World Philippines Organization is once again calling the young gentlemen of the Philippines to join Mr. World Philippines 2018. 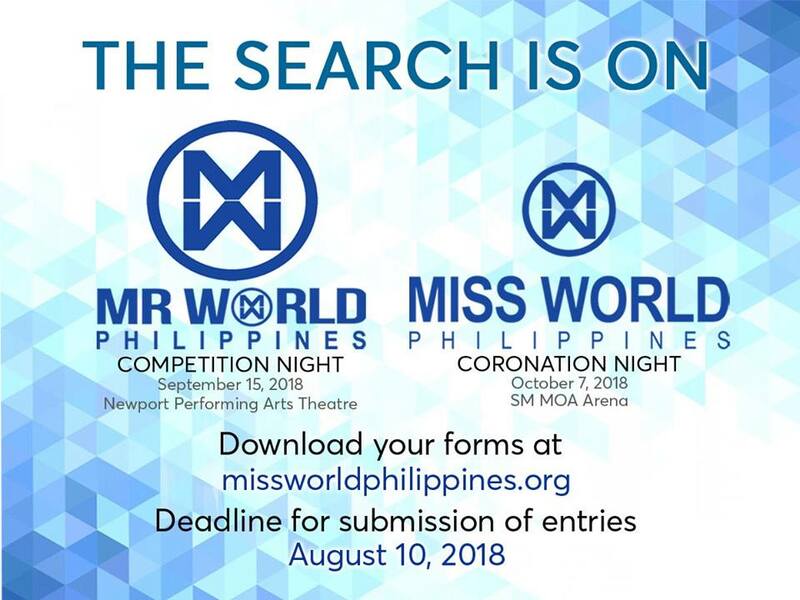 Deadline of submission of entries will be on August 10, 2018, You can download the form at www.missworldphilippines.org. Successful applicants will be invited to screen in person a week after to select the official candidates this year. Other titles at stake are Mr. Supranational Philippines and Mr. Eco International Philippines. Competition night will be on September 15, 2018 at Newports Performing Arts Theater. Winner will represent the country at Mr. World 2018 which will be held here in the Philippines on January 27, 2019. 100 countries will be competing on the said male international pageant. Now on its second year, MMPI Organization presented the 41 official candidates (22 ladies and 19 gentlemen) of Mr. and Ms. Philippine Islands 2018 to the members of the press last June 30 at The A. Venue Hotel, Makati City. The candidates strut their stuffs by walking on the ramp wearing their swimwear and evening gown/formal wear. The show was hosted by the reigning Miss Philippines 2018 Sammy Anne Legaspi and Nina Taduran, one of the MMPI Organization board members. Though the date and venue of the pageant is yet to be announced, the organization will be giving five titles this year: Mr. and Ms. Philippine Islands 2018, Mr. and Ms. Philippine Islands – Luzon, Mr. and Ms. Philippine Islands – Visayas, Mr. and Ms. Philippine Islands – Mindanao and Mr. and Ms. Teen Philippines Islands 2018. According to their official FB account, Mr. and Ms. Philippine Islands is a new pageant that will not only promote Philippine Tourism but give the public a kind of pageant that will never tamper the result. Check out the photos below as captured by JR Noses.